In 1910, at the age of 43, Frank Lloyd Wright traveled to Europe to present what would become his most beloved collection of structure illustrations: the Wasmuth Portfolio. One of these famous drawings was something Wright called “Boathouse for the University of Wisconsin Boat Club.” Twenty years later, the architect included this same boathouse in an international exhibition of six of his greatest works. 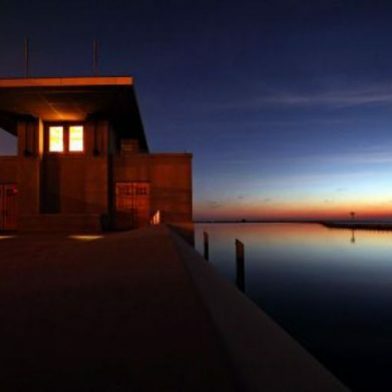 The boathouse idea was obviously a favorite of Wright’s, featuring design elements seen in other local treasures like the Martin House and the Larkin Building – large vertical piers supporting horizontal planes. Sadly, it was never constructed. It was one of Frank Lloyd Wright’s most significant projects that had never come to fruition – until now. Completed in 2007, the Rowing Boathouse is open to the public for tours and available for rent for special events and meetings. DESCRIPTION: The Club Room is ideal for small meetings or receptions. Outdoor space can be utilized (weather permitting) to expand the capacity. With beautiful views of the Canadian shoreline, the Peace Bridge and sunsets, the Fontana Boathouse is a great place to entertain or meet. Plenty of parking and easy access to and from I-190 make this a venue of choice for many.